Las Vegas nights can be real scintillating stuff. And what better way to commemorate those nights than to hold your wine glass aloft! Moreover, what could be more exciting than to lose yourself under an open sky? Here are the best rooftop bars which you must visit to get the real taste of the brilliant Las Vegas nightlife. Wish to experience downtown Vegas? Head straight for Commonwealth, the glitzy cocktail bar that offers you the perfect meeting place and enjoy a cozy drink with some good old friends. The 6,000 square foot rooftop bar is elegantly decked up with bistro lights, comfortable couches and park benches with a wide dance floor just in front of the bar. There is another main room downstairs which sports long tables and sophisticated chandeliers. And of course, if you are looking for some special treatment, try to procure an entry to the closed-door secret room, known as the Laundry Room. You need a password to enter in the room and no cellphones are allowed inside. Now that makes things more interesting, doesn’t it? Located right next to MGM Grand, Topgolf has become one of the hottest new concept in Las Vegas party zone. The four-storied spacious venue is a complete entertainment spot as a wide range of delicious food and drinks are always handy. But the actual charm of the place is the interactive golf games and balls that score themselves. With climate-controlled driving bays, spectacular open views of the Strip and an exciting pool with a swim-up bar, Topgolf is a place where you can just stretch your legs, soak in the atmosphere and chill out with your drink. This open-air bar, located at Las Vegas Downtown, offers an amazing bird’s eye view of the Las Vegas cityscape. Go by the elevator to reach the third floor and be at the center of all the action. Open only three days a week, this rooftop bar is refreshingly low-key in comparison to other Vegas bars. The foods and drinks are also reasonably priced. But the specialty of the Roof Bar is that it also has a theatre for guest speakers and a café. So if you are not really in the mood for a hard drink, the option is always there. Live bands and mouth-watering Mexican food make Diablo’s Cantina one of the most happening joints on the Strip. This 13,000 sq. ft. hangout is located in front of the Monte Carlo with a huge patio that overlooks the Strip below. With a theatre at Monte Carlo coming up, the scene is scheduled to get busier. The food and drinks are simply mind-blowing and has a fixed happy hour. Wanna try your luck? Take part in Wheel O’ Sin that offers random deals on drinks during the happy hour. What does the city look like when it’s far down below? Visit Ghostbar, located at the 55th floor of the Palms’ posh Ivory Tower, to see. The inside is done in a black, white and fuchsia color scheme which is both elegant and exotic, giving this boutique nightclub a warm vibe. The 14 foot high floor-to-ceiling windows and a spectacular outdoor patio give an unparalleled view of the brilliantly decked out Vegas cityscape. Long couches and a swanky bar create the perfect setting to unwind yourself with your favorite drink after a tired and hectic day. As the name suggests, it is the beer lovers’ heaven in Las Vegas. This rooftop beer garden boasts of more than 100 brews, giving you plenty of options to choose from, including nearly 36 brews on tap as well as an extensive selection of handcrafted beer and liquor cocktails. Make yourself comfortable at long wooden picnic tables and taste the scrumptious food from either a roaming cart or a full menu to accompany your beer. Chat with friends, enjoy your favorite sports team’s performance or play a game of pool – your options at Beer Park are endless. Nestled on the roof of the Downtown Grand’s casino, the Citrus Grand Pool Deck is a 35,000 square feet entertainment zone complete with a restaurant, full bar, semi-private cabanas, backyard games and many more. Casual and approachable, this rooftop beauty has a beautiful grassy seating area with umbrellas and outdoor day beds that allow you to relax with your favorite drink. Among an extensive list, do try the Green Iguana with mezcal, Midori Melon, and fresh honeydew juice. Often you will find exotic herbs garnishing your drink, freshly procured from their garden of organic herbs. Though part of a hotel, Citrus is free entry, so go in and groove to the music beats. An impressive selection of whiskey, rare beers and craft cocktails adorned with homemade garnishes and mixers – that’s what makes Oak & Ivy one of the top-rated rooftop bars of the Las Vegas Downtown. Built inside an old shipping container, the bar has a wide patio presenting a grand view of the Vegas nightlife. You can also climb the stairs up to the top of the container to find an extra seat to get a bird’s eye view of the ambiance. Seeking an unparalleled night life experience? Drop in to Chateau’s Rooftop, the next door neighbor to Beer Park. Located under the legendary replica of the Eiffel Tower at Paris Las Vegas, the 22,000 sq. ft. space boasts a dance floor, bar area and a wide open view of the Las Vegas skyline. Ideal for wild bachelorette parties and for single guys, the Chateau is open three days a week, from Wednesday until Saturday, making the weekends a high-energy affair. Set at the top floor of 11 storied Cromwell hotel, Drai’s is arguably the best place when it comes to the ambiance. One half of the club is indoors, decorated with luxurious leather seating, while the outdoor part sports a massive pool, towering palm trees and swanky neon marquees. Drai’s has got the most panoramic views of Las Vegas to magically lighten up party nights and give the most glamorous backdrop for dancing. 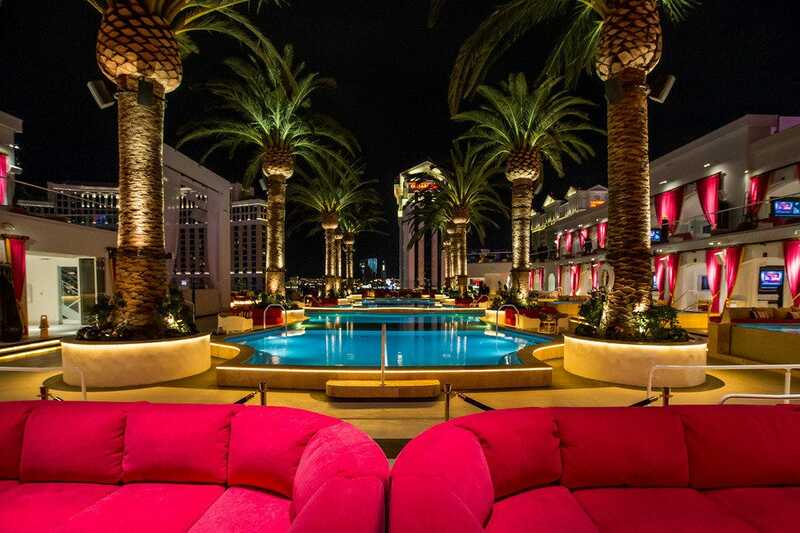 Enjoy the regular gigs from the nightclub indoors or go outdoors and let the night breeze sweep over you — Drai’s is equally impressive both ways. 51 stories above the ground, with a wide panoramic view of the Sin City and a cool, refreshing breeze. Welcome to Las Vegas’ wildest nightlife destination, Voodoo rooftop nightclub. Located directly above the elegant and exotic VooDoo Steakhouse, the bar has a spacious lounge that spills over to a spectacular deck. During the weekends it transforms into the wildest dance floor with loud music playing to the magically charged up atmosphere. Soak in the ambiance along with tempting brews like Love Potion or the Witch Doctor, which blends rum and dry ice into a mysterious cocktail. The stunning view of the dazzling cityscape is an added bonus. What is a day club by the morning magically transforms into a pulsating rooftop bar as the evening sets in. Marquee is the ultimate experience for all your five senses with its state-of-the-art technology, intense sound, rich décor with vibrant lighting and color and visual effects. Armed with the best DJs, performers and celebrities from across the world, Marquee has etched a premier place for itself in the Las Vegas nightlife. Spend the summer evening by the poolside grooving to the electronic music The seasonally domed enclosure is equally vibrant during the winters.